This is an old picture, taken a little over 6 weeks ago. It was one of my favorites meals — to eat and to shoot. 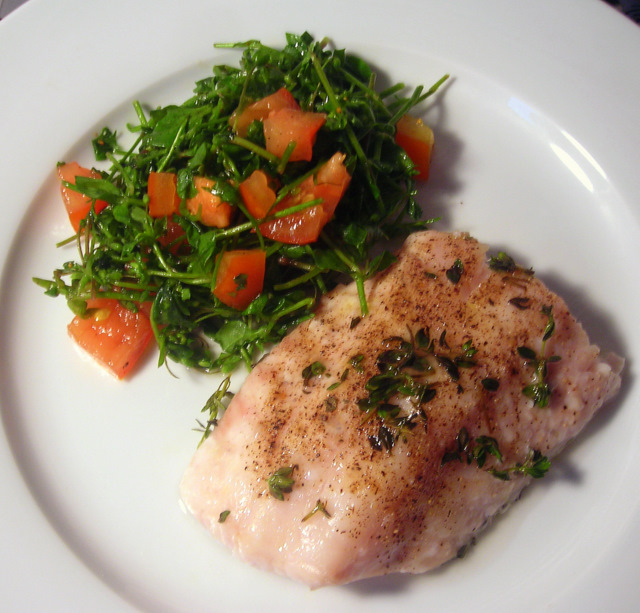 So many people underestimate the pleasure of a piece of fish or chicken, prepared simply and well. We seem to have forgotten what food tastes like, with our over-reliance on ingredients like balsamic vinegar, sriracha and truffle oil. As if these ingredients are magic bullets that can reinvigorate our jaded palates. When you pay attention to the food you cook and bestow on it the respect that it deserves, the need for the next “in” ingredient is soon forgotten, and a whole new world of flavor opens up before you. Your taste buds will soon thank you. This is barely a recipe, it’s so embarrassing. Take one fillet of fresh wild black sea bass, season with salt, pepper, chopped fresh herbs and 3 tablespoons olive oil, then broil at 350 F for 20 to 25 minutes. The chickweed and tomato salad is just as spartan. Dice a couple of heirloom tomatoes or 1 ripe Jersey tomato. Toss with 1/2 lb. chickweed, then dress with lemon juice, olive oil or walnut oil, salt and pepper. Serve at once. 14 Jul	This entry was published on July 14, 2011 at 2:37 am. It’s filed under cooking, food, food photography, general, summer and tagged black sea bass, chickweed, fish, food photography, heirloom tomatoes, locavore, lunch, salad. Bookmark the permalink. Follow any comments here with the RSS feed for this post. Oh my gosh…can you come make this for me every night? It looks amazing!! !